The total income was at Rs.523 crore as against Rs. 521.6 crore (YoY). 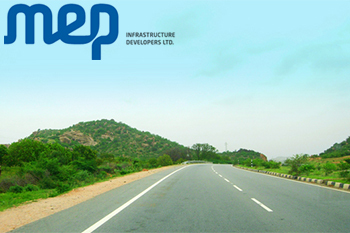 MEP Infrastructure Developers Ltd is currently trading at Rs. 41.7, down by Rs. 0.55 or 1.3% from its previous closing of Rs. 42.25 on the BSE. The scrip opened at Rs. 43 and has touched a high and low of Rs. 43 and Rs. 41 respectively. So far 1222639(NSE+BSE) shares were traded on the counter. The current market cap of the company is Rs. 686.85 crore. The BSE group 'B' stock of face value Rs. 10 has touched a 52 week high of Rs. 67 on 17-Jul-2015 and a 52 week low of Rs. 34.2 on 12-Feb-2016. Last one week high and low of the scrip stood at Rs. 42.9 and Rs. 39.85 respectively. The promoters holding in the company stood at 69.36 % while Institutions and Non-Institutions held 14.88 % and 15.76 % respectively.